modem. The modem will automatically be installed with the server. Please read the README,txt file before stating !! You should also install the RXTX library, which is used for hardware PTT. Ubuntu users can do this via synaptic, or doing 'sudo apt-get install librxtx-java'. audio in and audio out. are done in the server. 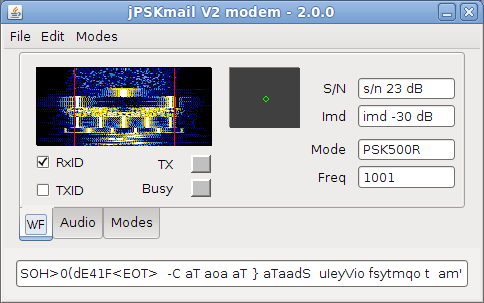 '/usr/local/share/pskmail_server/rflinkserver.pl' after the modem is running. ~/.pskmail/pskmailrc.pl config file, which is read on startup.